All BiOrb fish tanks are fitted with their patented filtration system. The central air tube is at the heart of this system and is not just there to be attractive. This tube performs a vital task. This is known as the biorb filter. 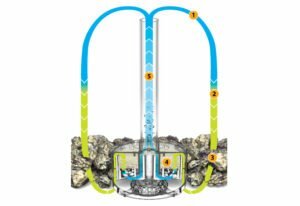 Forcing bubbles of air up the central tube, the filtration system ensures that 100% of the water capacity is circulated around the BiOrb and through the filters. This creates oxygen for the fish to breathe and removes carbon dioxide. There are three basic forms of filtration in a BiOrb tank: biological, chemical and mechanical. As water moves around the BiOrb filter it passes through what is known as the ceramic media. This is a surface of large rocks made up of sintered glass which become covered in filter bacteria. As the water then moves over them the bacteria consume the toxic elements of waste (ammonia) and convert it into safer materials (nitrate). Larger waste will pass through the ceramic media and is sucked into the filter cartridge. The filter consists of a sponge and fine mesh designed to trap waste and keep it out of the main body of water. Before water passes out of the filter cartridge and back into the main tank it passes over small granules. These granules are a special BiOrb mix designed to remove by products of biological filtration, stabilize the water and make it crystal clear. Maintenance of this system is incredibly easy requiring only two products. The first is ceramic media which should be replaced or partially replaced yearly. You can easily obtain this for a low cost of around £8.50. The filter cartridge is then changed easily every four to eight weeks. It is as simple as emptying the bin: remove filter and discard. Bought as part of a kit: the BiOrb standard service kit, the cost is around £8. You also get a cleaning pad for the surface of your tank and water preparation chemicals for a partial water change. The BiOrb filter and filtration system has got to be one of the best on the market right now.